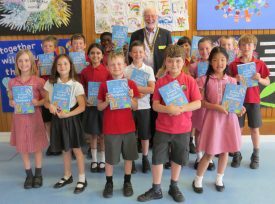 In the last week of the school year, children were discovering about sabre-toothed tigers and dinosaurs, as illustrated dictionaries were handed out to all Year 4 children in Warwick schools by David Smith, President of the Rotary Club of Warwick. In all over 350 dictionaries were delivered to children in 7 schools across Warwick as the summer term came to an end, and children became engrossed in finding out some weird and wonderful facts. David is pictured here with some of the children at Coten End School. Over 750,000 school children in the UK and overseas have received a Rotarian donated dictionary through the Dictionary4life project over 11 years to assist their literacy and stimulate interest in “old fashioned” books.